E. 8-12 miles N.W. of Calais. F. South of base to mid-channel. 8/10 Cloud up to 7000', Mid channel to over French Coast 4-5/10th. Cloud 6000-7000. Clear above. J. 1 F.W. 190 destroyed. When flying at about 15000' in a North Westerly direction about 8-12 miles from Calais, I noticed 3 FW.190 beginning to climb from behind. 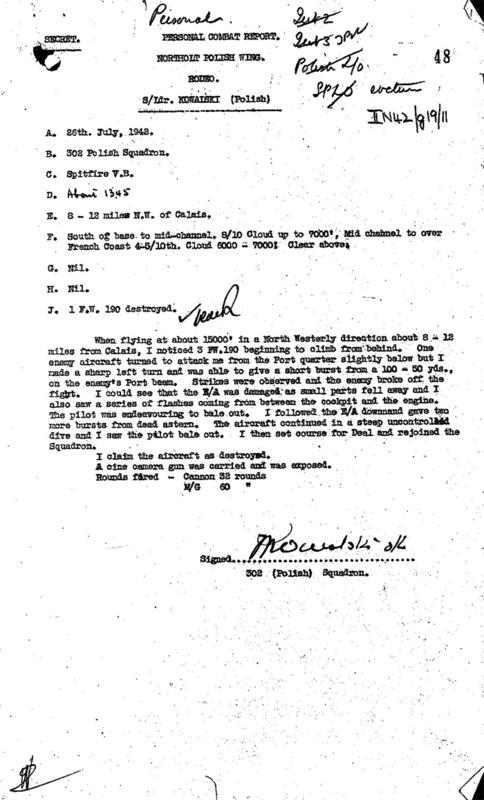 One enemy aircraft turned to attack me from the Port quarter slightly below but I made a sharp left turn and was able to give a short burst from a 100-50 yds., on the enemy's Port beam. Strikes were observed and the enemy broke off the fight. I could see that the E/A was damaged as small parts fell away and I also saw a series of flashes coming from between the cockpit and the engine. The pilot was endeavouring to bale out. I followed the E/A downnand gave two more bursts from dead astern. The aircraft continued in a steep uncontrolled dive and I saw the pilot bale out. I then set course for Deal and rejoined the Squadron. I claim the aircraft as destroyed. A cine camera gun was carried and was exposed.